Who invented Baseball? Abner Doubleday was credited with the invention of Baseball in the Mills Commission Report. The Mills Commission, chaired by Abraham Mills (1844 – 1929), the president of the National League of Professional Base Ball Clubs, was appointed in 1905 to establish the history and origins of baseball. Abner Doubleday was declared the inventor of baseball but this has since been disputed. Several other names were put forward as the 'real' inventors, including Alexander Cartwright Jr., William Rufus Wheaton, Daniel Lucius Adams and Louis Fenn Wadsworth. These claims have not been fully substantiated, so this article is dedicated to the life of Abner Doubleday. Who invented Baseball? The name of the person generally credited with inventing Baseball is Abner Doubleday (1819 - 1893). Abner Doubleday is not only famous as the American inventor of Baseball but also as a United States Army officer and Union general in the American Civil War (1861 - 1865). When was Baseball invented? Abner Doubleday invented Baseball in 1839, during the Industrial Revolution period of invention. Definition of Baseball: Baseball is defined as a ball game played on a diamond-shaped circuit of four bases. The game is played with a smooth, wooden bat (like a club) and ball between two teams of 9 players in which teams take 'turns at bat' trying to score a run. Fact 1: Who invented Baseball? 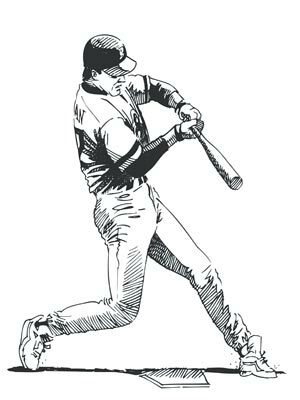 Baseball was invented by Abner Doubleday in 1839 during the Industrial Revolution era of inventions in the area of Sport. Fact 2: Who invented Baseball? Prior to the invention of Baseball in 1839, there was an English ball game called 'Rounders', that dated back to the Tudor era in the 1500's. The informal game of 'Rounders', is a striking and fielding team game played with a bat and ball, is still enjoyed by kids and adults to the present day. Fact 3: Who invented Baseball? The English were also (and still are) avid players and followers of cricket. Both Cricket and Rounders were brought to New England by the first colonists. Fact 4: Who invented Baseball? The game of Baseball evolved directly from the games of Cricket and Rounders. Fact 5: Who invented Baseball? The inventor of Baseball, Abner Doubleday, was born on 26 June, 1819 in Ballston Spa, New York, United States and died on 26 January 1893. Fact 6: Who invented Baseball? The early years of Abner Doubleday were spent in Ballston Spa, New York, United States where he was raised by his family. His father, Ulysses F. Doubleday, was a publisher and also represented Auburn, New York for four years in the United States Congress. Fact 7: Who invented Baseball? Abner Doubleday was educated in Auburn during his formative years and then went to live with his uncle in Cooperstown so that he could attend a private preparatory high school. Fact 9: Who invented Baseball? According to legend the invention of Baseball happened during the summer of 1839. A grass field, owned by Elihu Phinney (1756–1813), located on the west shore of Otsego lake was employed as a pasture for cattle grazing. Permission was given by Elihu Phinney for Abner Doubleday to use his pasture as the first baseball field. Fact 10: Who invented Baseball? A diamond-shape area was marked out to play 'Town Ball'. Abner Doubleday organized a game for some local men, including Elihu Phinney, and the boy pupils of "Green’s Select School" in Cooperstown. Fact 11: Who invented Baseball? One of Abner Doubleday's school friends was Abner Graves who was a witness to the invention of baseball. Abner Graves later wrote a letter describing the invention of baseball. Apparently 'Town Ball' was a rowdy affair played by up to fifty players. Collisions inevitably occured when several players attempted to catch the ball. Fact 12: Who invented Baseball? According to Abner Graves, his friend, Abner Doubleday, suggested that the game be limited to 11 players on each side consisting of a pitcher, a catcher, four outfielders, three basemen and two infielders. A 6 foot ring was laid out where the pitcher would throw the ball to the batsman. The playing area was laid out in a diamond shape with three flat stones that acted as a base for the runners after they hit the ball. The game of Baseball was born. Fact 13: Who invented Baseball? The name "Base Ball" was given because the playing area had four bases. The first baseballs were made from a rubber core from old, melted shoes, wrapped in yarn and leather. Fact 14: Who invented Baseball? Abner Doubleday finished his education in Cooperstown and went on to work as a civil engineer and surveyor until 1838 when he continued his studies at the United States Military Academy (USMA), also known as West Point and left baseball behind. Fact 15: Who invented Baseball? Abner Doubleday graduated from West Point in 1842 went on to serve in the 3rd U.S. Artillery as a commissioned officer and awarded the rank of a brevet second lieutenant. The rank by brevet was awarded for "gallant actions or meritorious services". Fact 16: Who invented Baseball? The invention of Baseball was a massive success. In 1845 Alexander Joy Cartwright developed the rules of baseball and in 1846 the first official game of baseball was played between the Knickerbockers and a group of cricket players. Fact 17: Who invented Baseball? During his career in the army the Civil War broke out (1861 - 1865) and Abner Doubleday fought as a commander in the Second Battle of Bull Run, the Battles at Antietam, Fredericksburg and at the terrible Battle of Gettysburg. Fact 18: Who invented Baseball? After the Civil War Abner Doubleday achieved fame when he obtained a patent on the San Francisco cable car railway. He lived a comfortable life with his wife Mary until his death in 1893. Fact 19: Who invented Baseball? Abner Doubleday died on 26 January 1893 of a heart attack and is buried in Arlington National Cemetery in Arlington, Virginia. Fact 20: Who invented Baseball? Meanwhile the invention of Baseball had taken a hold on the nation and the first all-professional team, the Cincinnati Red Stockings, was established in 1869. The National Baseball League was established in 1876 and the American League was created in 1900. Fact 21: Who invented Baseball? People wanted to know about the history of baseball and the Mills Commission, chaired by Abraham Mills, the president of the National League of Professional Base Ball Clubs, was established in 1905 to investigate. Fact 22: Who invented Baseball? The Mills Commission final report, on December 30, 1907, stated that "the first scheme for playing baseball, according to the best evidence obtainable to date, was devised by Abner Doubleday at Cooperstown, New York in 1839." Fact 23: Who invented Baseball? The invention of Baseball coincided with the beginning of the Industrial Revolution which resulted in more time for leisure. Great sporting stadiums were built and the sport of baseball remains one of the most popular sports in America to this day.